Coconut oil is like Mary Poppins bag: she could continually pull new and exciting things out of her carpetbag, and coconut oil is progressively being used for new and exciting things. This is especially true when you combine coconut oil with beauty treatments or household purposes. Coconut oil is one of the most commonly known and used oils (in more places than just the kitchen). Although it has a high saturated fat content, the medical community has allow this substance to make a comeback. People are using in on the skin, in their hair, in homemade body products, and around the house. Be prepared to buy in bulk, because you won’t believe the numerous ways you can use this magical oil. 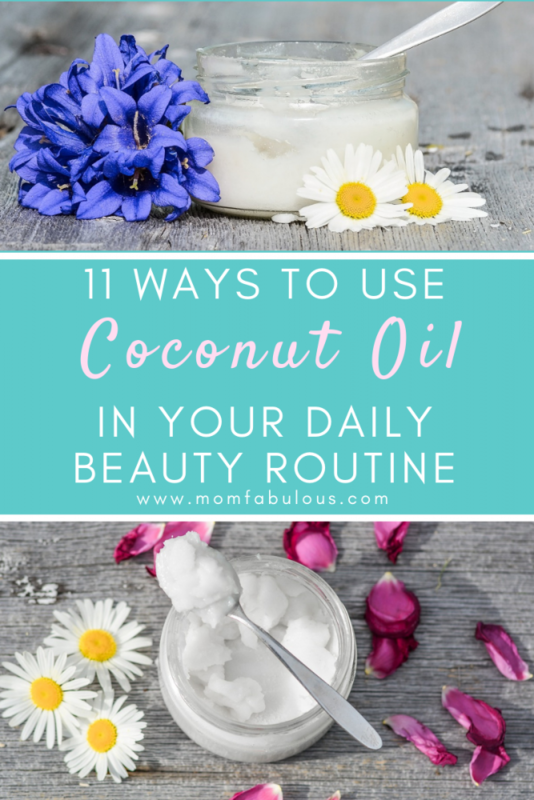 Here are 11 new ways that you can add coconut oil to your beauty and home routine. Have you ever tried rubbing a thick chunk of coconut oil into your hands? You’ll be delivered a refreshing lotion as it melts between your palms. After a minute the oily sensation will go away as your body absorbs the healing ingredients of the oil. Coconut oil nourishes your body with healing properties that are readily absorbed into your cells, without building up a residue. As a Mama who washes her hands frequently (for a variety of unmentionable reasons), you will appreciate the effects of coconut oil lotion. Rub a spoonful of coconut oil into your hair for a deep conditioning treatment. All the way from your scalp to the ends of your hair will be refreshed. This is also works great as a beard moisturizer! Next time you go relax in the tub (which is hopefully soon for a Mama like yourself! ), add a scoop of coconut oil to the warm water. As it melts, it will soften your skin and fragrance the air with a mild coconut smell. Don’t worry about buying more shaving cream, because coconut oil will do the trick. It can lather up on your skin and provides a thick enough coating to prevent razor knicks or burns. Skip the store-bought makeup removers that are filled with harsh chemicals (which will require you to apply an extra dose of coconut oil face lotion in order to rehydrate your face). Coconut oil works just as well to gently and safely remove all makeup from your eyes and face. Plus it leaves your skin moisturized, nourished and refreshed! Rough cuticles and brittle nails are a common ailment. Stop experimenting with those weird products from the drug store (C’mon Mama, you know you’ve tried one before!). Coconut oil is the solution you’ve been searching for. Gently rub into your nails and over your cuticles. Before bed is the best time to apply this treatment so it can hydrate, strengthen, and rejuvenate your nails while you’re hands are being distracted (with changing diapers, folding laundry, or doing dishes that are par for Mama life). The anti-inflammatory (and semi anti-itch) properties of coconut oil make it the most soothing rash cream. Apply to bug bites, inflammation, rashes, dry patches, or general skin irritations. You want to soothe your baby’s bottom with an all-natural remedy for those poor diaper rashes. Coconut oil is naturally anti-inflammatory, antiviral, antifungal, and antibacterial, plus hydrates and heals skin. Apply this as a barrier between you little one’s bottom and all of the moisture that gets trapped in a diaper. Use this as a preventative measure or as a treatment option. Side note: this also works well when you’re potty training and your toddler is still getting irritations while he/she is learning how to wipe well. You’re probably thinking, “No way. This Mama loves her coffee too much. I can’t add coconut oil to my mug!” Just try it; replace you cream and sugar with one spoonful of coconut oil. It will add a bit of natural sweetness but a huge portion of energy to boost your mind and body for the day! Here’s another benefit to including coconut oil in your coffee: if you drink that on an empty stomach, it will healthfully coat your digestive tract to keep your body running smoothly. Translation: it will keep your bowel movements regular! Not to mention, what Mama doesn’t require an extra dose of morning energy? Check out our favorite Organic Coconut Oil here! 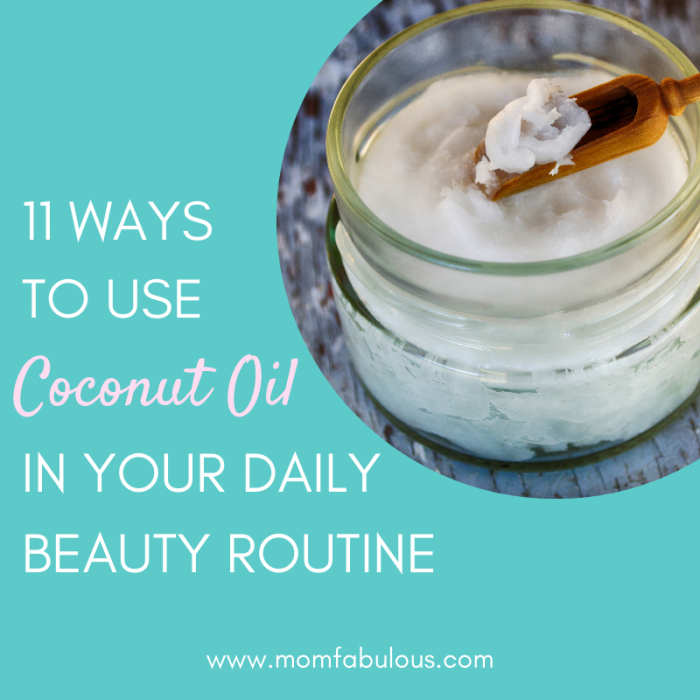 It’s great when you can buy one product for multiple uses, like coconut oil! Pick up an extra large jar when you’re at the store next time so you can try out some of these uses. What other ways do you use coconut oil? Leave a comment below!